One morning, an old man wanders out into the woods in search of his runaway cat. He finds instead a child with no parents and a murder with no corpse. JT Petty’s debut feature makes remarkable use of cool photography, creative sound design, lonesome locations and an intense score to tell a tale of haunting mystery. Cold in the best sense, "Soft for Digging" manages to create moments of great tension and terror using only three lines of dialogue in the entire film. '. . .Like the 1999 sleeper that became a national phenomenon, "Soft for Digging" breaks new ground in cinematic technique and is very, very scary. '. . .though "Soft for Digging" is more visually sophisticated, subtler, and closer in tone to the Coen brothers' first movie, "Blood Simple" than "Blair Witch." 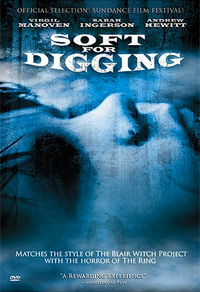 'It wouldn't be too far-fetched to suggest that his "Soft for Digging" is the most promising American horror debut since, well, "The Evil Dead."